Startup of a new radiant cooling system in Kalispell Montana. A new Messana Radiant Cooling system installed in a house in Montana (in Kalispell). The hydronic radiant ceiling is powered by a ClimateMaster geothermal water-to-water heat pump. The radiant system doesn’t feature any mechanical ventilation and dehumidification. However, thanks to favorable outdoor dry conditions, the heat pump can push fluid through the Ray Magic radiant ceiling panels at temperature as low as 45F and the ceiling temperatures, under the active panels, could reach about 55F on the surface. Being the dew-point in the house lower than 50F, there are good margins from condensations. See thermal images of the kitchen and living room (picture on the left). The house is efficiently cooled and maintained perfectly comfortable. The pictures were taken with a thermal camera Flir E8 with a 320×240 resolution. The color of the thermal images fades from purple to yellow based on the surface temperatures (from cold to hot). The Ray Magic radiant drywall panels are clearly visible in purple. The IR camera also takes digital visual pictures and allows for side by side comparison (visual vs thermal). The system is controlled by Control Magic, the Messana proprietary radiant cooling control platform. The control system adjusts the temperature of the radiant fluid based on the dew-point evaluated in each conditioned room. The controls also operate a water-to-water heat pump by measuring the temperature of a buffer tank (Boiler Buddy 30 Gal, model BB30) that acts also as hydronic separator. 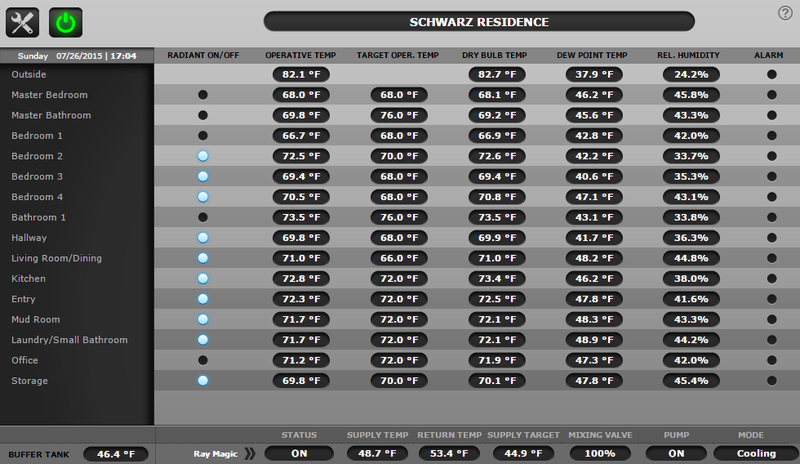 The picture below shows a screenshot taken on July 2015, of the Messana Radiant cooling control dashboard. This is the first radiant cooling system in Kalispell, and most likely the first one in Montana. This radiant ceiling system was design by Messana Radiant Cooling and installed by the homeowner, Molly Schwarz and her 3 young sons. They have been self building their own home over the past two years. Congratulation Molly on your new Messana radiant cooling and heating system. 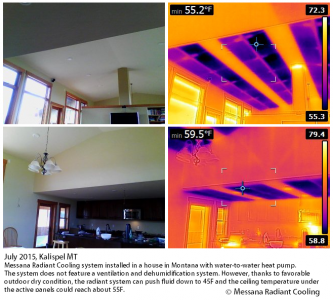 The first radiant cooling system in Kalispell!